The KTM 390 Duke has won the Indian Motorcycle of the year Award for 2018, the most credible and coveted award for motorcycles in India. The 390 Duke was announced winner amidst much fanfare at a glittering gala held at the Taj Diplomatic Enclave in New Delhi on December 13, 2017. Dr. Raghupati Singhania, Chairman and Managing Director, JK Tyre & Industries Limited and Aspi Bhathena, Editor, Bike India and chairman, IMOTY 2018 handed over the Indian Motorcycle of the Year trophy to Rajiv Bajaj, Managing Director, Bajaj Auto Ltd on behalf of the IMOTY jury, comprising of the top 16 motorcycle journalists in India. 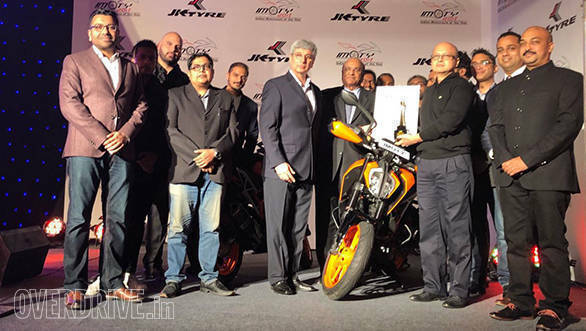 The KTM India team was also handed over a winner’s certificate by Aspi Bhathena, bearing the signatures of all jury members. The 2018 IMOTY marks the tenth year in existence for the award which makes it even more special for the Indian two-wheeler industry and the IMOTY jury as well. The jury for the 2018 IMOTY included Abhik Das and Rahul Ghosh of Auto Today, Arup Das and Jared Solomon of Auto X, Aspi Bhathena and Sarmad Kadiri of Bike India, Aninda Sardar and Sirish Chandran of evo India, Pablo Chaterji of Man’s World, Raunak Ajinkya and Kartik Ware of Motoring World, Abhay Verma and Shubhabrata Marmar of OVERDRIVE, Devesh Shobha of Top Gear India and Vikrant Singh. The IMOTY jury was thus represented by eight prestigious automotive publications from the country. Speaking at the awards ceremony, Dr. Raghupati Singhania said, “The prestigious IMOTY awards have become synonymous with excellence in the Indian automobile industry, honouring bikes for now for over a decade. Every year these coveted awards recognise the best in class efforts in engineering, design, cost-effectiveness, adaptability to local conditions and above all customer satisfaction. As the proud associate of these awards since their inception in 2005, JK Tyre has always endeavoured to take these awards beyond mere plaudits to a true recognition of merit. Of the 20 new motorcycles launched in the country this year, the final short list of contenders for the 2018 IMOTY had a dozen motorcycles in the fray for the award. These include the Hero Glamour 125, Suzuki Intruder 150, Bajaj Pulsar NS160, Yamaha FZ25, Benelli 302R, KTM 390 Duke, Bajaj Dominar 400, Triumph Bonneville Bobber, Harley-Davidson Street Rod, Triumph Street Triple RS, Honda CRF1000L Africa Twin and MV Agusta Brutale 800. The final jury round was held on December 4 at Khushru Patel’s stud farm and bungalow in Lonavala where the jury members met to assess the chosen motorcycles further. 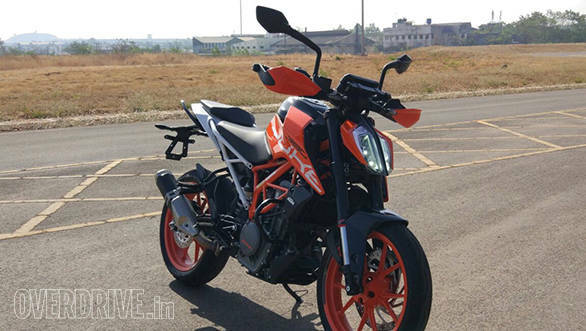 After the final round of assessments the list was whittled down to the final three motorcycles, namely the KTM 390 Duke, the Yamaha FZ25 and the Triumph Street Triple RS. The 390 Duke was voted winner unanimously, pipping the other two by scoring a significantly higher 107 points as compared to the FZ25’s 77 points and the Street Triple’s 68 points. The nominated motorcycles were judged on various parameters such as price, fuel economy, styling, comfort, safety, performance, practicality, technical innovation, value for money and suitability for Indian riding conditions. What makes the IMOTY the most coveted motorcycle award in the country is its fair and unbiased voting process that has the jury members choose a single winner solely on the basis of the merit of the product. While the TVS Apache RTR 200 4V was the IMOTY winner for 2017, it was the Yamaha YZF-R3 that was adjudged winner in 2016.